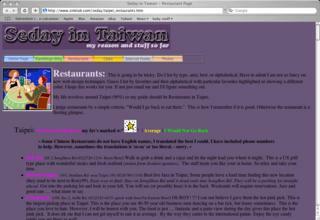 Seday in Taiwan some random guy's brief reviews on restaurants- he has three main catergories, worth the trip back, average and would not go back. I'll update as I find them, but since everyone's tastebuds are different, so take everyone's reviews (including my own) and try places out for yourself! When I want to eat Japanese food in Taipei, we usually head over to Sumie which is a upscale, sit down Japanese-fusion restaurant with good service and super fresh sashimi. The best bet to order if you have never been or are pretty hungry is the set course. They offer 3 different levels of the set course, as well as a vegetarian set course, which includes over 6 small courses and ranges from $1500 NT and up. Sometimes if you order different things off the menu separately, it ends up being around that much anyways. The menu has a wide array of sushi/sashimi, appetizers, hot dishes and hot pot- you can even try asking for requests off the menu if you don't see what you want. It's fun to see how they plate their sashimi and sushi- the portions aren't huge, but they make it look like artwork. 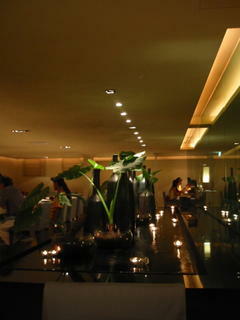 The ambiance is modern with dim lighting and a lot of reflective surfaces. The mood is pretty quiet and can be romantic, with 3 private rooms in the back, but lots of families come with kids. It's not a huge restaurant and they close the kitchen at 9PM, so you should call and make a reservation if you want to make sure you get a table. The service can be a little slow sometimes if they are busy, but they aim to please. I often get the seafood and fruit salad, which is a refreshing light salad with lettuce, crab, shrimp and fruits (but ask them to hold the raisins), but this week I was really craving California Rolls for some reason. As we got to the restaurant pretty late, our server apologized and said that they ran out of sushi rice and the sushi chef would try and figure out an alternative. At first, I was thinking ran out of sushi rice? Crazy! And they wouldn't use "regular" rice. But they were accomodating and the result was pretty appetizing and low-carb for all the dieters out there- it was a roll of crab, shrimp, asparagus, cucumber, avocado and masago wrapped in seaweed and thin egg layer. Mmm- masago! For our eel/unagi and deep fried soft shell crab roll, they just plated it ala carte without rice, and the three of us shared. I also ordered a fish chin/jaw- which I am surprised I like because I don't love fish. Fish chin has the most tasty, moist part of the fish, and the way that they grill it leaves the skin crispy and the meat flaky and not fishy at all. They include a lime with it which I usually squeeze to give it an added tart twist. 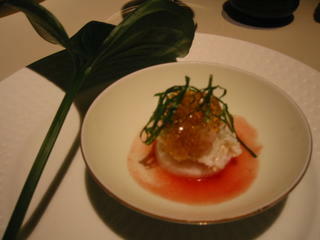 Of course, I eyed the set course dishes that my friends got and sampled a little bit here and there. 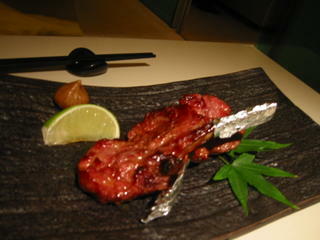 We usually get the set menu with the lamb chops, which are some of the best lamb I have eaten. It's tender, flavorful and grilled to perfection. You can pick up the chops since they wrap the bone with foil and devour it. The set course starts off with a custom appetizer, today it was crab with tomato sauce, and includes sashimi, salad, lamb chops, sushi, fish, soup, fruit and dessert. 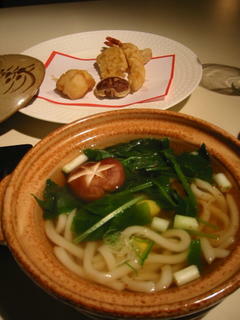 I've gone to Sumie as a couple as well as with larger groups, and usually everyone is pretty satisfied. It's a little pricey for the portion sizes, but every bite is worth it, especially if you are looking for fresh sashimi to hit the spot, you must try Sumie out. CLOSED (for a few years I think) updated 6/2009! I happened to eat at Guy's Cafe for a press luncheon that I was invited to. On this particular day, we could choose 1 of 5 pastas that was on the set menu: Pasta with (1) Clam garlic white wine sauce, (2) spaghetti meat sauce, (3) grilled chicken pesto sauce, (4) bacon mushroom cream sauce or (5) Calamari with squid ink pasta. 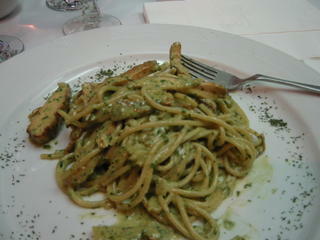 They all sounded really good, and I decided to go with the grilled chicken pesto pasta. We started out with a soup, which I'm sorry to say I didn't know what it was, but it was really tasty. It could have been either a seafood bisque or a pumpkin soup- it was reddish orange in color and creamy. The grilled chicken pesto pasta turned out to be a pesto cream sauce, which was just the right amount of cream and flavor. The pasta was the right consistency and all the flavors blended together. I was happy that there were also chopped white mushrooms in this dish. The spaghetti and clam garlic pastas seemed to also be a popular dish and also looked very enticing. The menu seemed to have a lot of pastas featured- and based on what I ordered, I'd go back and try more dishes. The location is near Sogo, on a alley street behind it and may be tougher to find. The atmosphere is pretty simple and busy, probably a great place for lunch. The service was quick and friendly. My other Italian restaurants have a new competitor for their pasta business! I'll write more if I go again and try out other dishes. 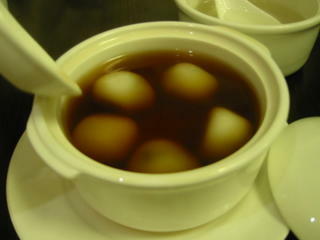 Sweet Dynasty is probably better known for its desserts (as its business card states it's a "specialist in Chinese Desserts"), but has a lot to offer in terms of dim sum and quick delicious Cantonese food. 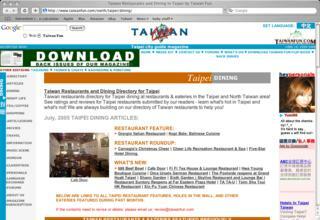 Apparently, Sweet Dynasty has original locations already popular in Hong Kong, and its Taipei location is always busy and you will usually have to wait for a table as they don't take reservations. The extensive menu features much for you to choose from, such as different types of dim sum, noodles, congee, stir-fried dishes, desserts and drinks- ranging from NT$60- NT$200+. The affordability of each item lets you have a wider selection, whether you are by yourself or sharing with a group. 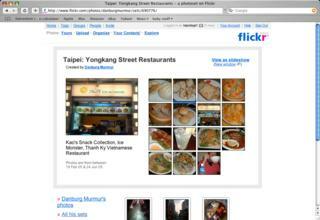 The walls of the restaurant have black and white photos of customers at the restaurant, perhaps from its earlier days or at its Hong Kong location. It's a pretty large space, brightly lit, with lots of small groups in midst of conversation and eating. I was happy to find out on this time that they do have a menu in English and you can order the item by its number. Sometimes you have to wave down a server to place your order, but they bring the food and clear the dishes pretty quickly, probably to help turnover the tables. We ordered drinks first, and I had an almond milk tea boba, which was a little more watery and the boba were a little soggier than I would like. I usually finish my drink, but I drank a little over half throughout the meal. 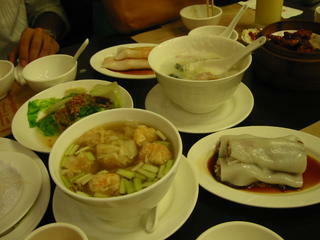 We got an assortment of dimsum, a pork/thousand year old egg congee, wonton noodle soup and veggies to share between four friends. 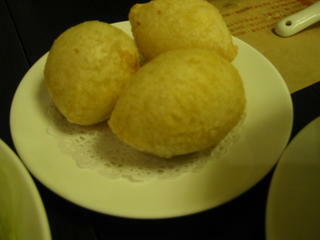 If you order dim sum to share, note that each order comes with 3 pieces. For the dimsum, my favorites were the bbq pork bun (chau sau bau), shrimp dumplings, shrimp rice noodle roll, and of course, the deep fried sticky rice ball (shien shway jiou) which is actually not widely available at a lot of dim sum places. Everything comes out fresh and hot, rather than on a cart where you aren't sure how long it's been there, especially for the fried dishes. I also really enjoyed the pork and thousand year old egg congee or porridge rice, which came with the right amount of each and wasn't too soupy or thick. The wonton noodle soup was a little bland to me, with no distinguishable flavors from either the wontons or the noodle or the soup. Also, the beef rice noodle roll was a big miss- as the first time, the beef was a little pink and undercooked, so we sent back and the second time was still not that tasty. 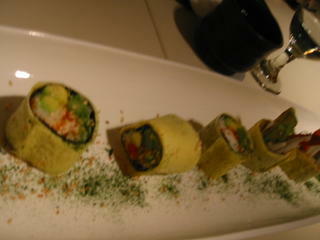 I will stick to the shrimp rice noodle roll, or try the vegetarian mushroom one next time. 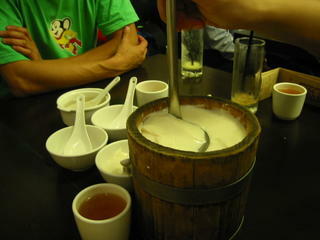 For dessert, we ordered its specialty Wood Bucket Tofu Dessert (dou-hwa) (NT$220) which can serve 4-8 people. We each had 1-2 bowls each and still had almost half left to take home. It's fun to scoop out your own portions of the slippery, smooth dou-hwa and then add the amount of sugar syrup to your liking. You can also order dou-hwa accompanied with other things, such as almond milk or fruit- the selection is quite extensive. We also ordered rice balls on the side (NT$30) which I thought were the smaller pink and white kind that come with shaved ice, but they were the larger kind with sesame on the inside. They were chewy and hot, but a little too chewy- maybe could have been boiled a tad bit longer. The menu has enough stuff on it that you could probably order different things each time you come. So whether you are coming just for dessert, or for a whole meal, check out Sweet Dynasty, and hopefully you won't have to wait too long for a table. Since I met friends at Joyce Cafe for afternoon tea, I didn't get a chance to check out the lunch/dinner menu. Instead we got their afternoon tea special which featured a three tier tray of goodies and drinks for two or more people to share. The tiers included finger sandwiches, dim sum, baked muffins and scones assortment, and cakes/desserts. The sandwiches were tuna and mini-club sandwiches; the dim sum were egg rolls and fried shrimp on top of tofu; the desserts included a carrot and chocolate cake. 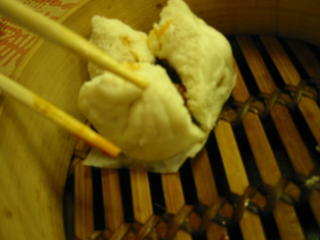 I liked the finger sandwiches and dim sum- they were bite size and disappeared quickily from the tray. The muffins and desserts on the other hand were kind of dull to me, lacking in special flavor or texture. 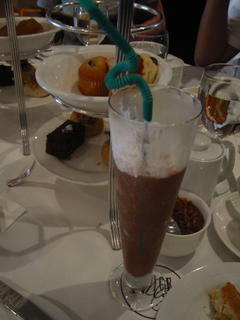 I happened to order a drink that wasn't included with the afternoon tea, which was iced hot chocolate, which was just like it sounds icy and chocolately. But I don't know if it was too sweet or had too much ice, I didn't really care for it though it came in a tall glass with a fun straw. Maybe I should add that I don't like chocolate milk or chocolate ice cream, though I am a fan of mocha frappacinos and hot chocolate. 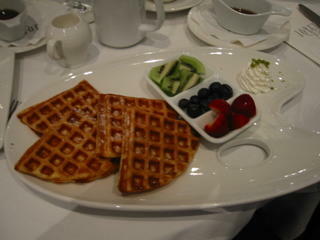 Our friends got the waffles with fresh fruit, which seems to be more a dessert or afternoon tea dish rather than breakfast in most places here. When I was here last year, my cousin and I went on the hunt for american style breakfast, or the perfect waffle, in which we took taxis to at least 3 or 4 different places, before we ended up at the Formosa Regent Hotel restaurant which did serve a pretty good waffle. The waffle here at Joyce Cafe was also pretty good- the waffle was thin and crispy, and served as four slices with fresh raspberries and blueberries, as well as syrup on the side. The service is a little fussy, but still needs work. One of my friends ordered a salad, which was never ordered or brought to the table. 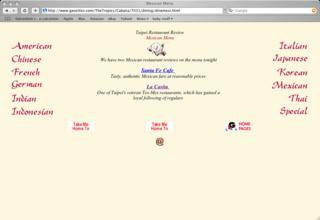 Perhaps they had too many servers not talking to one another. We also got amusement from the speed they liked to remove plates from the three tiered tray. We would put up plates to share food and soon as it was emptied, someone would come by and take away that plate. 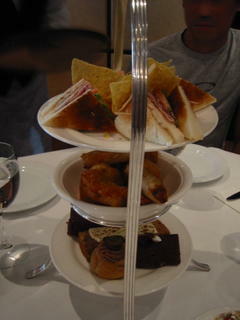 There were a lot of people there with afternoon tea special trays on their tables, so it seemed like a popular option. But it's on the pricey side, especially if the desserts that come with it are not as good as desserts you could get somewhere else.